Aukey has a nice discount on a three-pack of 3-foot Type-A to Type-C USB cords today. If you didn't have a USB-C powered device last year, chances are you will before the end of 2018. That means you'll need Type-A (i.e. standard USB) to Type-C cables to make all of your devices and chargers play nice with each other. 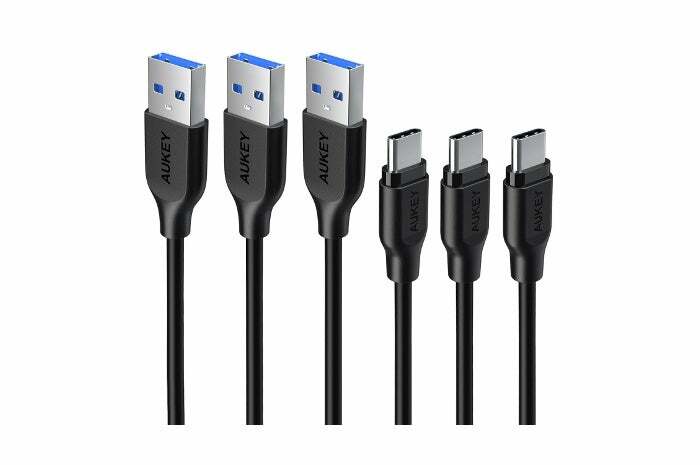 Today, Aukey via Amazon is selling a three pack of 3-foot USB 3.0 Type-A to USB Type-C for $7. The sticker price is $10, but if you click the rebate section underneath the price, then click Redeem, you'll see an option for "30% off 1 item(s)". These cords have not been examined by Type-A to Type-C guru Benson Leung, but they are from a known company with many happy customer reviews and the right specs. In other words, these wires should be safe for all your USB-C electronics. These cords feature 20 AWG (American Wire Gauge) wire, which Aukey says "supports fast and efficient charging." There's also a protective aluminum shielding wrapped in an outer layer of durable PVC. On the USB-C end of the cord is the key component: a 56k Ohm resistor. That's the key value you need for a proper power transfer from Type-A to Type-C to ensure power is transferring safely. If you have a phone that supports adaptive fast charging like the Samsung S8 or LG G5, this cord works with that. It does not, however, support rapid charging on the Nexus 6P and 5X, the Moto Z, one Plus 3/3T, Pixel devices, or the Nintendo Switch.